Cornelia Golf Club, connected to the resort by a short shuttle, is home to a Nick Faldo-designed golf course and a David Leadbetter academy, which is why it is one of Belek's most desirable destinations for serious golfers. The Cornelia Faldo Course is the first project in Turkey for Britain's greatest golfer of recent generations, and is a 27-hole complex that has garnered considerable praise in its short existence. Faldo's creation is a serious test, especially when tackled from the championship tees, as it measures close to 7,000 yards. The course is carved through a stunning pine forest, with a dramatic ridge of dunes running through the middle. 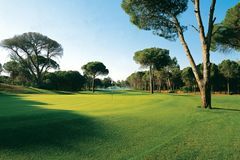 The 6-time major winner was delighted with the blank canvas for his project, as well as its sandy soil, and his creation has done much to aid the emergence of the outstanding Cornelia Resort as a major player in Belek. The Leadbetter Golf Academy is operated using the guiding principles that have seen the swing guru instruct Ernie Els, Nick Price and Greg Norman among others. Cornelia Golf Club is only five minutes away from Cornelia De Luxe Resort by a Free shuttle service. The Cornelia Deluxe Resort was only officially opened in 2006, and has been widely received as a welcome high end addition to the popular destination of Belek. The hotel itself is home to 381 guest bedrooms and suites in total, most of which benefit from sea views. Cornelia is perched right on the sea front, offering direct access to the sandy beach, and offers its guests a luxury all inclusive service, including a welcome drink upon arrival. The in-room facilities include a safe deposit box, central air-conditioning, telephone, deluxe bathroom, internet connection, satellite television and a music stereo system, while the décor and furnishings are modern and elegant. The outstanding facilities and excellent options for groups and families at Cornelia make it an extremely popular 5* choice for a golf holiday in Belek. The magnificent hotel is built around the five lovely outdoor pools, which are the perfect place to unwind and enjoy the sunshine. The resort offers an endless list of sports and activities, including tennis, volleyball, football, basketball, climbing, bowling, as well as fantastic water sports like wind surfing, sailing, jet-skiing, parasailing and banana boating. There is also a great kids club, with loads of activities, while the fitness centre is equipped with the latest training technology. The resort's Health Centre has an amazing array of indulgent beauty and wellness treatments, as well as a Turkish bath, sauna, jacuzzi and steam room. Around the Cornelia Resort, there are four restaurants and eight bars to choose from, including the a la carte dining rooms at Florian, Hedera and Nazar. The Deluxe Disco should appeal to the younger generation of golf holiday makers.